The New Moon arrives at 26 degrees of Pisces on Saturday, March 17 at 9:11 AM EDT. New Moons are a time in which to plant seeds of mindful intention. The darkness is an optimal time for watchful introspection. As we delve within the deeper dimensions of the self, we are honed with New Moon subjective awareness, facilitating a fresh approach to begin anew within an area of our lives. The New Moon encourages us to become our own best friend as the self intimately communes with the self. Even during the dark of the Moon, we know that she is there. And after all, the darkness allows the stars to brightly shine forth in their full magnificence. The Moon graciously allows for their spectacle when it is not her time to shine. As the outer light of the Moon is not visible to us, it is an optimal time in which to recognize our inner glow. Soon, when the light slowly begins to wax, we will gradually emerge from the darkness, for the ever increasing light brings forth yet another facet of our life, heightened by New Moon subjective experience which in turn imbues us with sage awareness. Life is like an ouroboros. 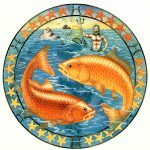 Pisces The Fishes reminds us of this as two fish swim in circular motion, navigating both beginning and ending cycles with fluidity and grace. We are each the head and the tail. We circulate within the realm of our inner and outer worlds. Upon the completion of one cycle, we find ourselves at the beginning of another. Each lunation blesses us with the opportunity for ever increasing consciousness, for we are imbued with layer upon layer of visionary expansion that serves to assist us on the next lap of our journey. Pisces The Fishes is a mutable feminine earth sign ruled by Jupiter and Neptune. The qualities of Pisces include compassion, empathy, artistry, sensitivity, otherworldliness, imagination, emotionality, psychic ability, and attunement to the collective. The shadow realm of Pisces includes martyrdom, a redeemer complex, escapism, victim consciousness, lack of personal boundaries, and rose colored glasses syndrome. Pisces embraces the archeypes of The Dreamer, The Mystic, and The Shapeshifter. Pisces possesses an instinctive awareness of the higher dimensions of consciousness, thus feeling both the woes and ecstasies of the world. 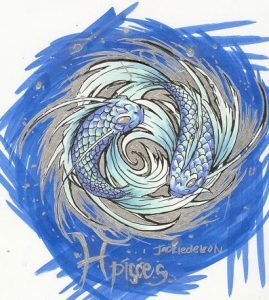 Pisces strives for a state of transcendence, possessing an inherent tempermental make-up in which to attain this. Pisces embraces the unity of all beings as ONE. We are in this oceanic life togther, swimming for our lives, often against the currents which are pulling us back into the depths of despair and loneliness. Before we are able to break free of the current, we must sometimes allow ourselves to become submerged by the forces of cosmic gravity in order to feel what has been self-rejected so that we may swim through the turbulent currents resurfacing with efficacious healing and a newly discovered source of enlivenment. Chiron The Wounded Healer is also in Pisces, closely accompanying the New Moon. Our woundedness may feel more palpable. Chiron is a powerful ally despite its challenges. He helps us to move more deeply into that which feels unhealable. Within this very space of our soul, we find the path to our own healing, which ultimately contributes to the healing of this world. Wherever there is a preponderance of Pisces in your star chart, there is immersion into the oceanic depths of intense emotion and heightened sensitivy. Within this area of our natal pattern, we are invited to welcome the tender parts of ourselves, knowing that within this layer of vulnerability lies great strength. Vulnerability is a product of courage. Our invitation allows for its sentient presence, thus facilitating our own inherent ability to commne with unconditional love for ourselves and for others. When we reject or repress this vulnerability, we find ourselves flailing in an emotional spiral of tidal proportions. These turbulent emotions often leave us in states of pain, confusion and disorientation. Self-alienation emanates from fearful refusal to allow ourselves to free fall. There is a soft landing place within one’s own heart. Upon arrival, we open our hearts to ourselves. In doing so, we find within, the elemental water realm of receptivity. As we resonate with this state of fluidity, there is an outpouring of love. Dive deep. Greet the creatures from the depths of time. Breaking the surface you will once again behold the stars.